After reading about the recent controversy surrounding Gardasil and the State of California’s mandatory vaccination laws, the first thing that came to mind is that the government, (Federal, State and Local) is slowly chipping away at our parental rights. I remember a story aired on Fox News sometime in early 2006 in which a young girl was taken for an abortion by the school’s nurse and later died of complications because the parents hadn’t been notified. The girl was obviously too embarrassed and/or sick to tell her parents and died of Septicemia. Her parents were being prosecuted for manslaughter because they did not take her for medical care within 24 hours of the girl’s running a temperature. Had they not had their rights taken from them, this girl could be alive today. Instead the school (local government) took her to the abortion clinic because the state government ruled that parents do not need to be notified to protect a minor’s privacy. All this was brought about because of Federal legislation allowing abortions as a result of Roe vs. Wade in the early 1970’s. Although I didn’t follow the story to its conclusion and have no idea whether or not the parents were found guilty, it angers me to see the same rights being taken from us in terms of vaccinations. For years it has been known that many vaccinations have resulted in irreparable damage to a number of infants and young children. High fevers are usually the ultimate cause of much neurological damage and some have resulted in death. According to a former special ed teacher from Broward County, Florida, a high percentage of students suffered brain damage after being vaccinated. These children were born healthy and whole but due to complications from being vaccinated, are now mentally challenged. The same is being evidenced in LeRoy, New York with Gardasil vaccinations and the authorities are denying the vaccine had anything to do with the subsequent neurological damage to several of those immunized. Activist Rosa Koire has come forward to warn all parents that it is their legal right to take the health and wellbeing of their children into their own hands. If a child should suffer irreparable and sometimes fatal complications as a result of being vaccinated, the parents may be held accountable even if their child was vaccinated without their knowledge or consent. This is an abomination to the rights of parents notwithstanding the emotional toll it will take on the entire family. I feel that the only option we have as parents is to stand strong together, no matter what our political orientation, and protect our rights as caregivers of these precious gifts of life. Do the research for your state and county to see what has been mandated. If your rights have been taken from you, start a community group to bring about change. Together we are strong and this may be our only opportunity to protect our children and our own rights as parents. Some of you might have heard of the forex market; others may not have. For those that don’t know, the forex, or FX market, is short for foreign exchange market and is the biggest liquid financial market in the world, involving the trading of world currencies (i.e. Euro, US Dollar, UK pound, etc.). There is a lot of money to be made by trading in the forex market; of course, for anyone unfamiliar with trading, making money can seem impossible what with all the intricacies and jargon involved. eToro is an online trading platform that has been specifically designed to be as easy to use for newbies as it is for experienced traders and provides everyone with the tools needed to make a genuine income online. Having been a newbie (I still am one in many respects) and used eToro for a good few months, I am here to tell you about my experience. Let me start by telling you have I have found it using the software. I, like many others, found the forex market to be a blur of numbers and constantly changing arrows. eToro has made it very easy for me to understand. Downloading the software, literally takes about 30 seconds and from there you can start buying and selling world currencies. The user interface is perfectly designed for beginners, in fact, the entire eToro product, from support to community is built to make it a comfortable place for newbies. For anyone that is new to the FX market, I recommend starting with the practice platform, which allows you to trade in virtual money – I have learned a lot from doing this. I also had a great experience with the ‘education center’ which offers a wealth of live webinars, e-courses, and the very useful eToroPedia, which provides all the information related to trading and the answers to any questions you may have. After approximately eight months of using eToro, I find myself visiting eToroPedia on almost a daily basis. I have also had a great experience with the real-time trading, allowing me to change currencies without delay. The only problem I have had when trading is when I had a temporarily slow internet connection – which is of course no fault of eToro; having said that, in my experience, you will need a fast internet connection to stretch your money. I have only had to contact the help desk via telephone on a couple of occasions, but each time I was left very satisfied. On both occasions I called with an issue related to slight issues with the software. On the first call, the female staff member on the telephone was very polite, helpful and surprisingly knowledgeable about the software. One the second call, I was provided with a call back from the help desk after the line went dead, and was once again provided with a solution – excellent customer service. Having moved from trading virtual money to the ‘big leagues’ and real money, I was keen to withdraw my first significant amount of money. Granted, US $200 is nothing compared to what the eToro ‘gurus’ around the world are making but for me it was a tidy profit, especially for a South African trader. I once again contacted the help desk and was given the process for withdrawing money for the first time. This involved emailing eToro copies of a utility bill, passport and money withdrawal request form. 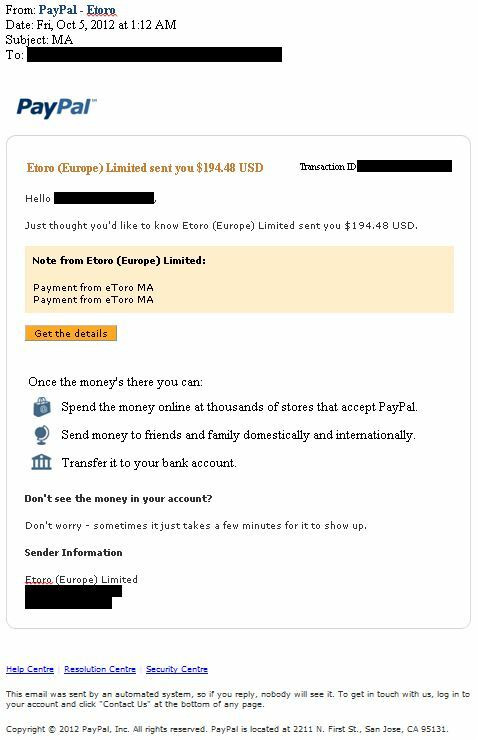 Having done this, I received an email with a reference number, and two days later a payment into my PayPal account. Once again, a thoroughly satisfying experience. I am very happy with eToro Forex trading platform and I am happy to recommend it to anyone. Yes, there is a risk of losing money, but responsibility with this must lie with the individual and should never take away from what eToro offers. 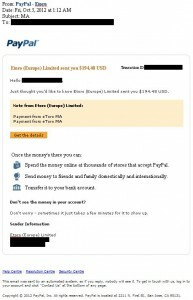 Here is a proof of payment from eToro. They really do pay. Couldn’t have been any more happier!!! Trading in Forex market can be simple enough, and includes relatively few parameters as opposed to stock market trading. However, it can be very dangerous to trade in Forex market without learning the basics. This is why online forex trading services such as the eToro forex trading platform provide traders with tools to educate themselves and learn to trade like a pro. eToro forex trading platform puts a lot of emphasis on educating traders and gives traders plenty of opportunities to master trading techniques as they develop their trading skills. Before you even sign up for a free eToro forex trading account, you can click on the “Education Center” on the eToro website to learn about trading on Forex with eToro. For traders who open and fund a forex trading account, eToro also offers a complimentary eToro Matador e-course, a specially designed online course composed of 12 individual lessons that take any trader through the basic workings of the forex market and onto advanced trading and analysis techniques. Furthermore, eToro also provides members with the OpenBook social trading network that gives all users the opportunity to learn from expert traders and even to apply their skills immediately through the “Copy Trader” feature. Best part about this training/education is that you can learn from eToro training courses and apply your learning to other trading platforms.